Although Licklider probably was talking about how computers should enhance the search process of titles, the role of the computer indeed remains important with the rise of e-readers and pads. In the last holiday for one day at Amazon, the sales of e-books exceeded the sales of the regular physical paper book. These numbers show how the e-readers and e-books are catching up. I don’t know whether books will remain or not, but I can imagine that in the very near future, more people are reading books from a screen than from paper. Why? Digital publishing can really cut the costs for publishers and retailers, this often means a lowering of the selling price towards the consumer. Example: a Kindle (Amazon’s e-reader) costs around $180. The price of a paper book is $26 on average, while the price for an e-book on the Kindle is less than half of that: According to the company, more than a half million titles costs $10 or less. So in comparison, in 11 purchases you could justify the $180 you had spend on the Kindle. This one is pretty obvious. Let’s say you are a student or knowledge worker who has to carry a dozen books every time you step out the door. That is easily 10 kg of books to carry, while having a pad or e-reader, you are looking at 2 kg and less. With a few dozen GB’s memory in your e-reader, you won’t have to carry any books ever again and don’t get me started on those clumsy paper newspapers. One of the ideas I like very much and you see in every industry is the ‘pay only what you need’ development. The start-up company Inkling has come with a solution to the problem of the e-textbook. E-textbooks are not popular on e-reader because it is difficult to ‘study’ from a e-text. The way you study is very different than the way you read a novel. Diagrams, graphs, illustrations are very important to the textbook narrative and dynamic, interactive texts could be a solution to make it more appealing. Inkling allows readers to jump into any chapter. Users don’t have to buy the entire textbook: They can just buy a few chapters and later get the entire textbook. Like an iTunes model, Inkling breaks the big part into segments. Segmentation happens in a lot of industries, and now you can also order chapters instead of only the entire book. This seems not of any use when you want to read a fiction novel (or are you someone who only wants to read the beginning and ending?) but with textbooks and studying books, this feature is come in handy. I like this idea of non-linear reading. Obviously the whole Internet is made up this way and it is imaginable that the book narrative is turning into a do-it-yourself reading, saying: ‘choose your own adventure’. Google Ruining the Party ? 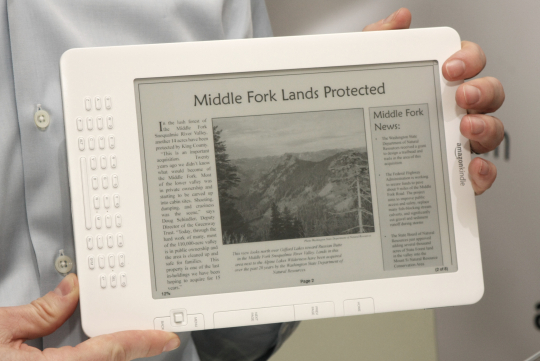 Is the service of Google Book Search going to affect the e-readers model to make money? According to the research of Hannibal Travis, an Associate Law Professor at the Florida International University College of Law, there is no evidence that publishers will find negative impact upon them. Google Book Search is the ambitious project of Google to digitize every single book. Their research has shown that there are approximately 130 million books and after several years the Internet company has done 7 million books. Anyone can consult the books for free. Is Kindle now committing suicide by integrating an Internet option in the apparatus? If all the books are downloadable for free at Google, why bother spending money on e-books? At this moment, the books at Google Book Search are incomplete. In the books segments are missing, obviously for copyright reason, so of course e-books with a pricetag are still superious. But Google is still in a lawsuit concerning this copyright issue. I wouldn’t be surprised if those sharks at Google can manage to set a deal with publishers in the same way they set a deal between YouTube and music labels. If this will be the case, the rise of e-books and e-readers becomes not more than a hype, a bubble waiting to burst and new revenue models will needed, something we recognize from the music industry. « Are E-books just a transitional technology?